Peoria was the whiskey capital of the world. Alcohol production was a business that meant a huge income for the distillery owners, who in turn made a huge contribution to the community in the form of culture, buildings and sculptures—some of which still stand today. It also provided jobs, not just in the alcohol industry but for a myriad of businesses that supported the distilleries. The production of whiskey and beer was a source of important taxes for both the federal and local governments. But times change, and in January of 1920, it all came to an end. 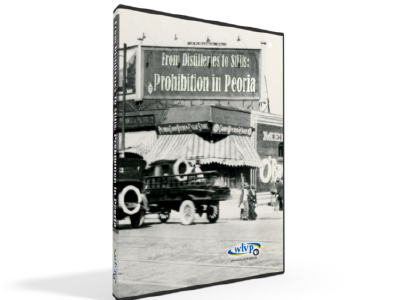 WTVP presents From Distilleries to Stills: Prohibition in Peoria, a new documentary looking at the causes of Prohibition, its effects on Peoria, and the legacy left behind. It also shares a few stories of the more lawless and colorful activities that it inspired. Hosted by Brian “Fox” Ellis.